Usually when something’s in the middle of town, it isn’t considered a secret. 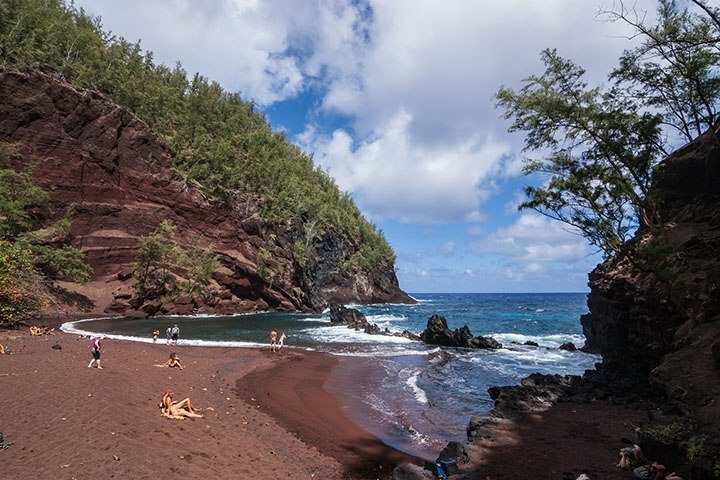 In the case of Kaihalulu Beach, however, in the town of Hana, Maui, the crimson cove of crunchy red cinders is a squirreled away sanctuary of scenic bliss located smack in the center of town. 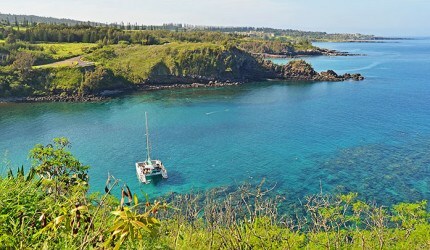 Tucked at the base of a cinder cone that separates the beach from the town, Kaihalulu has a protected cove that’s perfect for snorkeling and wading, as whitecaps thunderously crash on the rocks that form the barrier to the cove. For some of the island’s daredevil youth, a popular activity at Kaihalulu Beach is jumping off the 15 ft. rocks, and ceremoniously splashing in the waters that sparkle with every shade of blue. Reaching the Red Sand Beach, however, isn’t exactly easy, and is part of the reason the beach is so empty despite its proximity to town. The thin trail that leads to the beach is at the end of Uakea Road, and is found by walking across the grass where the pavement comes to an end. There’s minimal parking on this part of the road, so it’s easiest to park by the Hana Ballpark and just stroll down the street from there. Visiting Red Sand Beach, however, can be very controversial, as scores of visitors every year end up hurting themselves on the trail. 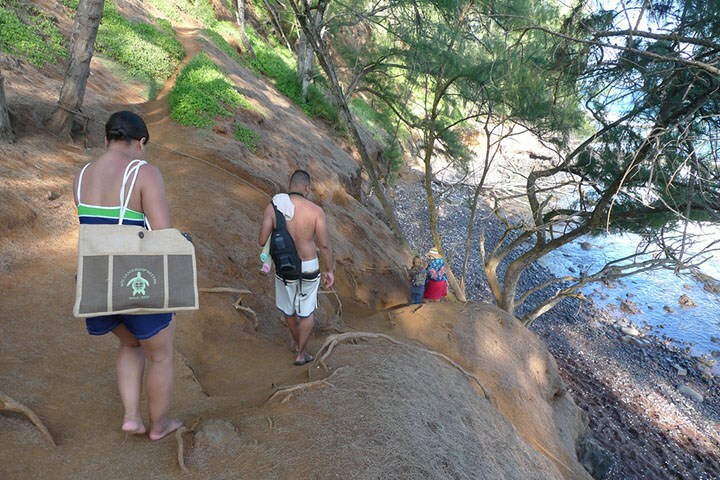 It’s imperative that visitors understand the dangers of visiting the beach, and that the trail to reach it is steep, narrow, slippery, and legitimately dangerous. The reward for navigating the cliffs, of course, is the chance to soak in spectacular surroundings and watch whitecaps swirl on red rocks, but requires confidence in your athletic abilities to avoid an emergency rescue. And, since there are no facilities at Red Sand Beach such as showers, trashcans, or restrooms, it’s imperative to pack out everything with you and leave the beach nicer than you found it. 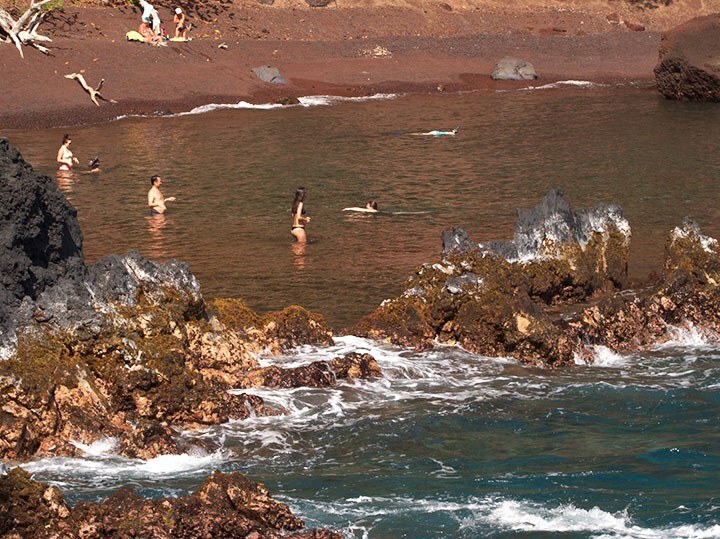 It’s also important to note that nudists often frequent Kaihalulu, as the isolated location provides a cove where tan lines don’t stand a chance. 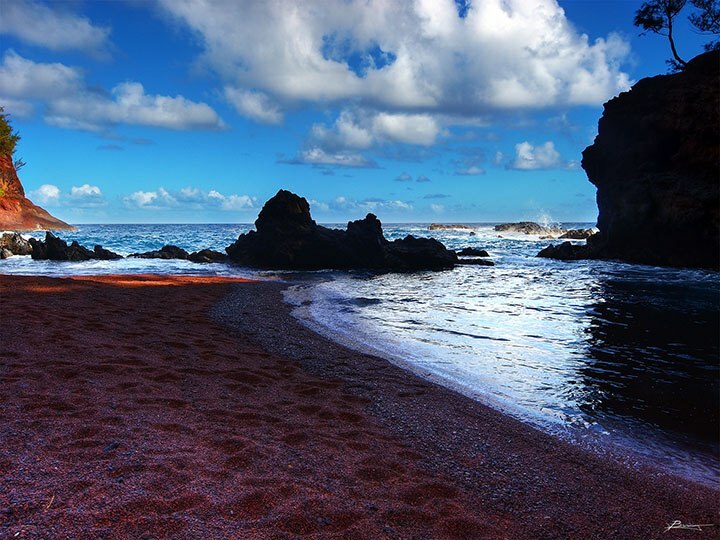 If you end up staying the night in Hana, one of the ways to have the beach to yourself is to wake up early and watch the sunrise illuminate the red in the rocks. Combined with the rhythmically crashing surf and the early whispers of a breeze, it’s a meditative moment of morning serenity in Maui’s most calming town.